Dez is a good girl who does as she's told and tries not to be noticed. Then she rescues a boy from a cage, and he tells her secrets about herself. Now inside her burns a darkness that will transform her. Everything is about to change--and neither Caleb, nor the Otherkin, nor those who hunt them, are prepared for what Dez will unleash. I devoured this book, right from the very first page it was loaded with action and never really stopped. I haven't read a ton of shifter type books, but I have to say this has become one of my favorites. What first intrigued me by this novel, was the fact that the main character, Dez, could shift into a tiger, and tigers are my favorite animal. 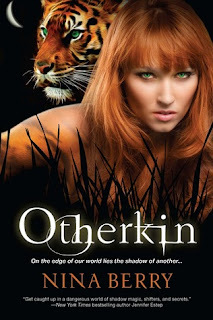 I hadn't really expected much going into reading Otherkin, afraid I would just be disappointed by it, but I ended up really loving it! Dez is a good strong character that knows how to think for herself and very quickly adapts to what is thrown at her. She definitely gets her share of shocking truths and things about herself thrown at her throughout the book. I really liked Caleb, the boy who's some kind of shadow caller, whom she saved from the 'Tribunal', who are after all the animal shifters. Although I really liked him, I felt like his character could have been a little stronger somehow, and maybe a bit more mysterious, to make it more interesting. Another character I really liked was Dez's mom. Instead of the typical parental figure that would freak out over the fact her daughter can shift into a tiger quite well. She was willing to step back and let her daughter do what is necessary (not sure how to explain further without spoilers! ).